This took some time. I actually did the 'Flaming Meatball', (Zero) first. I laid the tones in, keeping in mind the direction of the light source. Once it was laid in I moved on to the large P-40, working on the camouflage first, then moving to the areas of the plane not directly receiving sunlight. 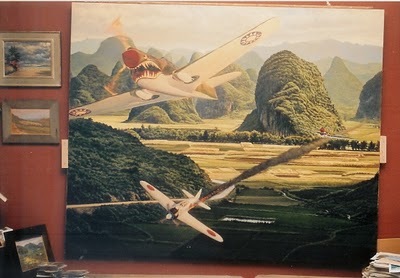 The challenge: stay in the middle key with the aircraft so the highlights will have "pop", yet the darker areas of the aircraft will fall relatively into place so they have depth and correct dimension, not only to each other, but to the parts of the landscape which the aircraft are immediately flying over. Once again, everything is just "laid in". The propellers are still not painted in motion, (the under painting color is still visible). From this point on I am going to work pushing and pulling the contrast of not only the aircraft, but the light/dark patterns in the landscape in the foreground and background. In seeing the picture as a whole I keep asking myself, What's next, what's wrong with the painting, and how can I get it to pop, or be more exciting? How can I bring it all together, and keep it moving and dynamic?